The story of a holy muse. She dedicated her mind to beauty and truth. She offered her heart to her faith. She sacrificed her body to Christ. Ode to Saint Cecilia tells the dramatic story of a modest young woman from Rome whose life has transcended time to influence poets, composers, sculptors, and painters. A patron saint to some, a muse to others, Cecilia has inspired George F. Handel, John Dryden, Henry Purcell, Stefan Maderno, John Waterhouse, Paul Simon, and scores of other artists over the past 20 centuries. 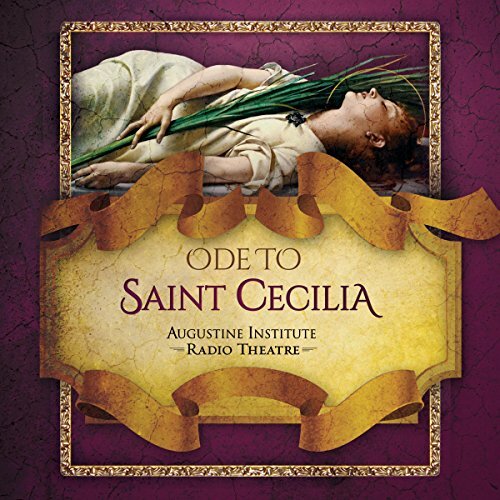 Augustine Institute Radio Theatre's Ode to Saint Cecilia includes cinematic sound, original music, and the award-winning talents of highly-acclaimed British actors, including: Hayley Atwell, Sir Derek Jacobi, Brian Blessed, and Dame Siân Phillips. Set against the backdrop of the great sacrifice of her martyrdom, Ode to Saint Cecilia is ultimately a celebration of the important role of the arts in showing us the love of God through profound beauty. st. cecelia is a hard story but it is told here in such a captivating manner with an inspiring twist of sainly inspiration and hope of heaven that i really loved it. martyrdom and human cruelty are difficult realities, this is not a story for young children. but my 13 year old has listened to it many times and it has sparked grest discussion. music, voices, portayal are all excellant. excellent voices telling an extraordinary story of a saint worthy of following her virtue and faith in Jesus Christ our Lord. Like an old time radio play! Wonderfully unexpected drama about the patron saint of music. Having just joined my church choir, it was perfect. Loved listening to this recording. I love this performance! The quality is outstanding and places you right there in time. Brings the first Christians to life. Well worth the time listening to it. Wonderful performances. I truly enjoyed this radio drama! I look forward to future productions!!! An excellent find! !